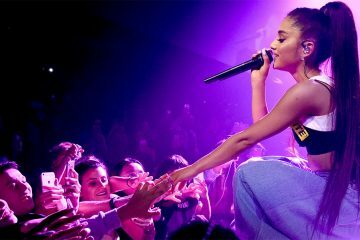 Ariana Grande is performing at the Amway Center in Orlando, Florida on Wednesday, May 29, 2019. Ariana made her first musical appearance in the 2011 soundtrack Music from Victorious. After CEO of Republic Records, Monte Lipman, came across one of her YouTube videos covering songs, he signed her to a recording contract in 2011 and subsequently released her debut album, Yours Truly (2013), which debuted at number-one on the U.S. Billboard 200. Her second studio album, My Everything (2014), also debuted at number-one in the United States and featured four top 10 singles on the Billboard Hot 100, the most by any artist in 2014; “Problem”, “Break Free”, “Bang Bang”, and “Love Me Harder”. Dangerous Woman (2016), her third studio album, became her first number-one album in the United Kingdom and produced the hit single “Side to Side”. Her fourth studio album, Sweetener (2018), became her third number-one in the US and yielded the successful single “No Tears Left to Cry”. Her upcoming fifth studio album, Thank U, Next, is scheduled to be released in February 2019. The title track was released as the lead single and debuted atop the Billboard Hot 100, while the second single, “7 Rings”, broke several streaming records. Grande is the first artist in the history of the chart to have the lead singles from each of their first five studio albums debut within the top-ten on the US charts. Critics have compared Grande’s wide vocal range to that of Mariah Carey. Her accolades include three American Music Awards, three MTV Europe Music Awards, two MTV Video Music Awards and six Grammy Award nominations. She has supported a range of charities and has a large following on social media. In 2016, Time named Grande one of the 100 most influential people in the world on their annual list. In 2018, Billboard named her Woman of the Year.